Sorry for another late blog post about a competition. Sunday, October 17th was Harvard’s fall competition, Harvard Beginners. This competition was pretty exciting from the standpoint that we did not have to leave at 5 AM to get there in time. Unfortunately for all of us this will not happen again until next year, this is the only competition that doesn’t start at 7 AM. 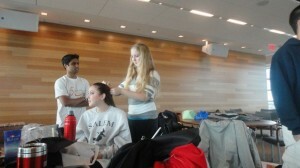 Despite the competition not starting until late we all met up in the atrium of stuviII for some quality bonding/hair&makeup doing time. And then we all migrated over to Harvard on the bus, and after some slight confusion about where were were getting off the bus we managed to get there. And from there the hair-doing continued. Sometimes I feel like dance competitions going by in a whirl of sparkles, hair, and makeup. More hair-doing ensued once getting to Harvard. Of course this is not true. Once all the hair and makeup was done we enjoyed some great dancing. Special congratulations to Fahmil and Kristie for coming in seventh place in the Bronze International Cha/Rumba! Now we all have some time to work on our technique can routines because our next competition is not until Brown University’s competition on November 14th. So keep working hard everyone!! Make sure you keep on coming to Saturday practices and to our Winner Wednesdays/Finalist Fridays to work more individually on your routines and technique! So! Start working hard because we’re all going to be AMAZING at Brown Competition this year and in the meantime get psyched for Montage! on the 7th. Write more, thats all I’ve to say. Literally, it seems as though you relied on the video to make your point. You certainly know what youre talking about, why throw away your intelligence on just posting videos to your weblog when you can be giving us something informative to read? Great article! Coming up with your web site needs terribly careful thought from headline, keyword placement, valuable content and style that specialize in the wants of your niche. Página Web super buena. Para leerla varias veces, si señor. Gracias !!! Besos !!! Beyoncé has received various awards. As a solo artist she has sold over 15 million cds in the US, and over 118 million records worldwide (an even more 60 million additionally with Destiny’s Child), making her one of the best-selling music artists of all time. At the 57th Annual Grammy Awards in February 2015, Beyoncé was chosen for six awards, eventually winning three: Best R&B Performance and Best R&B Song for “Drunk in Love”, and Best Surround Sound Album for Beyoncé. She was chosen for Album of the award but the year was won by Beck for his Morning Phase album. In October 2014, Beyoncé signed a deal to introduce an activewear line of clothes with British fashion seller Topshop. The 50-50 venture is called Parkwood Topshop Athletic Ltd and is set up to introduce its first dance, physical fitness and sports ranges in autumn 2015. The line will release in April 2016. Great site you have here.. It’s difficult to find good quality writing like yours these days. I seriously appreciate people like you! Take care!! Nein, das gab’ kostenlos zur Einführung! thanks for posting. This website is awesome. Besonders deshalb, weil Julie heute aus ihrem Alltagstrott entrinnen und eine andere Welt eintauchen konnte.Das kleine Biest wusste ganz genau, wie sie mich noch heißer machen konnte. Muchas gracias por el post. Una información muy interesante. Absolutely indited subject matter, thanks for entropy. Bei diesen schamlosen Camsex Pornos wirst du einfach der sein, denn wenn du deinen harten Pimmel mit ins Spiel bringst, hast du schon den richtigen Einsatz gebracht. Ich behaupte zu 99 % NEIN!! Es genial y vale la pena. Personalmente si todos los que escriben o bloggers hicieran un buen contenido para internet sería más útil para todos. No podía dejar de comentarlo.